Looking for graphic novels books? Biblio.co.uk hosts hundreds of of the finest online book stores and booksellers, including specialists in graphic novels. Use the list below to locate a specific specialist bookseller or book store near you. Or, use the form below to search the inventory of all booksellers who specialize in graphic novels. AOM Bookshop is a mobile bookshop that pops up throughout Indianapolis. We hold literary and art events throughout the city and our nonfiction books and author signings are held both virtual and in person. Check out our website for dates and times of events. Black Bean Books is a husband-and-wife operation tucked away in Michigan's beautiful Upper Peninsula. Since 2011, we have offered a small, specialized inventory of mainly non-fiction, rare and collectible books. Our customers appreciate our attention to detail and our professional, friendly service. Named after a 1957 jazz record by John Coltrane, Blue Train Books is a quality used bookstore located in small town destination Hogansville, GA. Our store is filled with clean, affordable, well organized used books, with some collectible and signed editions.Online, we handle only a select inventory of our more scarce and specialized items. Our online and store inventory does not overlap. In our listings, we strive to provide detailed and faithful descriptions so that the buyer may find the item that most closely matches what they are looking for in terms of condition and price.All items are listed, packed, and shipped by the business owner, who is himself a book collector. All items, even common editions, are stored, handled, and packed for shipping as if they are collectibles. Inquiries welcome. We are a small internet based shop specializing in Comic Books, Manga, and other Pop Culture and Geek Culture Items. An independent seller of new and used books, DVDs, CDs, Video games (both console and PC), software, cassette/VHS tapes, and odds and ends. Located in historic downtown Lafayette, Indiana, Main Street Books offers new, used, and remainder fiction books at low prices. Parigi Books specializes in science fiction, fantasy, mysteries, Italian comics and graphic novels and Italian language titles. The store is open by appointment. I am selling off the bulk of my personal collection, plus a few odds and ends. I abhor mercantilism and I believe that the current market exists at the expense of the joy of collecting. So you'll never see me price a VG+ below a Good Ex-Lib unless there is a wild discrepancy that would make a book totally unavailable to you, the collecter, the reader, my brother, my double. 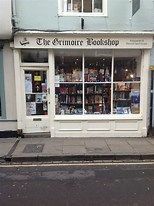 Our 17th century shop has two floors of books on a wide variety of subjects. We also specialise in esoteric titles, science fiction and fantasy. We are a 2 minute walk from York Minster, on the original Roman entrance to York. I've been shipping books and records to people for 6 years now. Get this stuff out of my house. I am a collector of modern first editions. I take pride in looking after the condition of my collection. I love collecting books, and I enjoy networking surrounding the sale of books.